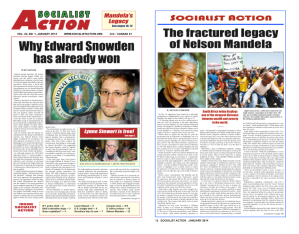 *The article above was written by Lee Smith of the Young Socialist Alliance. It first appeared in the November 1969 issue of Young Socialist magazine. Revolutionary socialists in the YSA foresee and understand the developing stages of the struggle for socialism, and, on the basis of a program embodying their understanding, they intervene to consciously organize each of these succeeding stages. Because capitalism, suffering from prolonged crisis on a world scale, cannot grant to working people many concessions they consider legitimate and even essential, the program of revolutionary socialism generally is a program for struggle around demands for these kinds of concessions – “transitional demands” which capitalism cannot satisfy, and which require, therefore, the taking of power by the working class in order to be realized. While the formal program of revolutionary socialism does not embody a picture of what the future socialist society will look like, revolutionary socialists share a vision of that society, if only in its broad outlines. There is no reason to be concerned about the absence of precision on this question. We cannot know what the socialist generations will decide to do, but the general lines of development we are able to forecast give us confidence in the wisdom of these decisions. What are these general lines of development that suggest themselves in the reality of today? In the immediate aftermath of the conquest of power, while the material basis for racism will have been smashed, and while we can safely assume that the heroic role played in the revolution by Afro-Americans and other third world peoples will have deeply shaken the racist ideas of many whites, some backward attitudes will persist for a brief time. During this period, we can expect forthright, decisive action by the revolutionary government to prevent the manifestation of race prejudice in any overt act of discrimination, as well as to rapidly remove existing inequalities in education, employment, housing and medical care. Many of the revolutionary leaders in the new government will be third world people. This will also be the time when Blacks, Chicanos, and other minorities will be able to decide whether they want to partition the socialist republic into separate states or join with whites in a singe, multinational revolutionary state. Whatever the decision each group makes, bonds of solidarity will displace mutual antagonisms as all sections advance toward communism and new generations are born into rationally and democratically planned economy of abundance. The nuclear family will undoubtedly continue briefly after the overthrow of capitalism on a relatively broad scale. But even in this initial stage, we can predict drastic changes in the role of the family. Rapid development of a household industry, communal kitchens and dining rooms, free automated restaurants, free day care centers and free boarding schools will liberate women from the drudgery to which they are assigned under capitalism, allowing them to enter any field of work they choose, and making possible their active participation in politics on an equal footing with men. As with third world people, it is likely that many of the revolutionary leaders will be women. Marriage will lose its legal sanctity. It is possible that legal (recorded) marriages and divorces could be handled by dropping a postcard in the mailbox. The prohibition against abortions will be scrapped and there will be free access to birth control for everyone beyond the age of puberty. Over time, it is reasonable to expect that monogamous marriage and the nuclear family will wither away along with other institutions carried over from class society. Children in a socialist society will not “belong to” one set of biological parents, but will look upon all adults as their mothers and fathers. In turn, adults will view them as children of the whole community. During the years they require of extensive care, training and affection, the children will be raised by professionals who choose to specialize in such work. The workers’ state established by the revolution can move immediately to abolish on a world scale the majority of suffering caused by disease. This is so because the problem under capitalism is not in most cases that there is no known treatment or means of prevention, but instead that it is not profitably to make these available to the poverty-ridden victims. Beyond the abolition of diseases for which the cure is already known, vast resources and energy freed by the elimination of waste and military spending will make possible conquest of diseases for which the cure is not yet known. The overwhelming emphasis of medicine will shift from treatment to the prevention of disease and the maintenance of good health. The mystique of American medicine which leads many doctors today to believe they rank somewhere above mortals and below the angels will disappear as more medical schools, training centers, clinics and hospitals are built, and as tens of thousands of revolutionary youth sweep past the ruins of arbitrary limits on the number of doctors to embark on medical careers. Medical care will be one of the first things made free to all by the revolution. A major campaign of the victorious American revolution will be a crash program to provide every member of the society with a decent place to live. This will mean the construction of millions of light, clean, modern apartments to replace the decaying, squalid, pest-infested living quarters of people in cities all over the U.S. Along with housing, socialism will provide free, safe and efficient mass transportation systems to reduce reliance on automobiles. The garbage the capitalists have dumped into the oceans, rivers, earth and atmosphere will pose a challenging problem to socialist science. We may suppose that great attention will be devoted to restoring and maintaining ecological balance. In line with this, there will undoubtedly be imaginative experimentation designed to find the most desirable combination of features from the rural and urban environments for human habitation. The capitalist courts will be junked in favor of workers’ tribunals which will act according to a new and simplified code of social justice. Bourgeois law books will be sent to the museum. Eventually, even this softened coercive apparatus will be allowed to wither away, as the concept of crime recedes into the past. Socialist schools will be radically different from the regimented, authoritarian schools we see in capitalist society today. Students and faculty will jointly administer the schools, just as they will participate in the government of society as a whole through their elected deputies to the soviets or councils that will administer the state and economy. Along with an immediate and continuing upgrading in the range and quality of course material, we can project more free time for students all the way down to elementary level for self-study of topics they wish to pursue, more boarding schools, more freedom for students to travel from one geographic area to another. Of course, there will be free access to education all the way to the postgraduate level. In addition, there will very likely be special programs conducted for everyone – to teach languages for example, an area of backwardness in this country that will need to be remedied in an internationalist society. A precondition for the victory of the revolution will be the revolutionary temper of the men in the armed forces; the revolutionary reorganization of the army, navy and air forces will be part of the actual process of the revolution. Once power is secured, the new state may want to maintain at least part of these mighty forces under arms long enough to discourage resistance by the ruling classes in other nations to the revolutions that will occur there in the wake of the American success. After that the socialist societies of the world can begin dismantling their military operations together, and begin looking for means to dispose of the heinous chemical-biological-nuclear weapons stockpiled by imperialism. The revolution, in coming to power, will nationalize the major means of production and exchange, bringing into existence a new mode of production, based on social ownership of the means of production and collective appropriation of the social surplus product. While workers will continue to be paid wages in money to exchange for commodities during a long initial period, a socialist mode of distribution will eventually replace the old method as abundance overtakes scarcity and automation and cybernation eliminate human labor from the sphere of production. It is entirely realistic to speculate that, within a century after the insurrection, money and commodity production will have withered away as absurdities in an economy requiring no human labor and producing more than enough to satisfy the needs of everyone. Long before this happens, workers will have ceased to have to pay individually for rent, food, medical care or transportation. The length of the work week will be sharply reduced immediately and very soon after that cut in half. The management of shops and factories will be in the hands of those who work there. Again, more than administering their own workplace, these workers will also participate in the administration of the whole economy and society through their elected delegates. The kind of freedom Gorky wrote about will only be possible in a society like the one sketched above. It is impossible under capitalism. Freedom under capitalism consists of consciously recognizing the necessity for socialism and dedicating you life to its achievement. In embracing that freedom, you help the entire family of mankind take the first step from capitalism to communism. You can take that step yourself by joining YSA.